Providing the sound earth science information necessary to help resolve major societal issues in the Central Great Lakes region is beyond the capability of any single earth science organization. Therefore, the State Geological Surveys of Illinois, Indiana, Michigan, Minnesota, New York, Pennsylvania, Ohio, Wisconsin, and the U.S. Geological Survey have formed the Great Lakes Geologic Mapping Coalition (GLGMC). Its mission is to (1) develop, in partnership with map users, a dynamic database of comprehensive geologic information and to create updatable, three-dimensional (3-D) geologic maps and map products that delineate, in detail, the surficial deposits down to bedrock, and (2) produce, with partner groups, derivative map folios, assessments, and economic analyses that directly support critical decisions concerning natural resources, hazards, and environmental management in the region. The objective of the Coalition is to provide earth science information that can support sound, unbiased, and cost-effective land-use decisions. Results of alternative plans to restore, preserve, or sequentially develop mineral, water, and environmental resources can be modeled, thus avoiding resources loss or over regulation. The Coalition strives to increase communication among scientists and resource decision-makers in public, private, educational, and environmental sectors. Through cooperative interactions and education of the broad user community, the Coalition seeks to make its information available and used as widely as possible. The Coalition conducts a cooperative surficial geologic mapping program that focuses on societal issues in high-priority areas across the region. 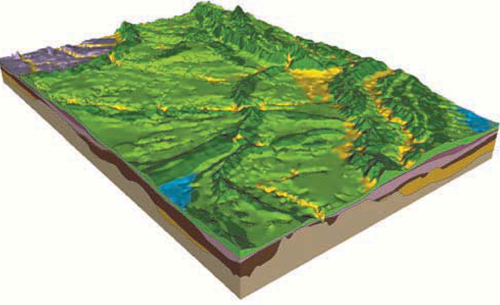 The program emphasizes detailed geologic map products, at the quadrangle-map scale of 1:24,000 (1 inch on the map represents 2,000 feet on the ground), including 3-D surficial geologic maps, as well as traditional surficial geologic maps. Geologic maps at this detailed scale are the optimum for addressing societal problems. Such maps depict sequences of surficial materials in adequate detail to be useful in identifying ground-water aquifers and sand and gravel resources. They can also be used to evaluate aquifer sensitivity to contamination. These maps identify geologic materials at construction- or environmental-site investigations. Regional surficial geologic map products at 1:100,000-scale will provide information for large areas where data are sparse because of low population density, and where detailed mapping is unlikely to proceed in the immediate future. Regional surficial geologic maps also can be used to depict important bodies of surficial materials and trends that extend across county and state boundaries. Mapping at both scales provides a geologic context for resolving or evaluating regional societal or technical problems, as well as for interpreting the site-specific information generated by geologic consulting firms. Modern surficial geologic maps depict the three-dimensional character of the entire sequence of geologic materials from land surface down to bedrock. Deposits are differentiated by comparing their physical properties, vertical sequences, and lateral distribution patterns with modern models of sediment deposition in glacial, river, and lake environments. Detailed distribution of sedimentary features and grain size can be displayed on cross sections, on block diagrams, and by using three-dimensional visualization software. 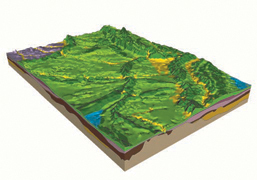 A three-dimensional geologic model shows the geometry of surface and subsurface geologic units. The relative position and age of the deposits are parts of the model, which actually add a fourth dimension: geologic time. Using new data from three-dimensional models, geologists can improve digital maps of buried units. Various perspective views can be assessed, and data can be checked for accuracy and internal consistency of units (that is, lower units can not appear above upper units). Furthermore, water-producing geologic units in such models can be input into commercial volume-modeling software to produce a three-dimensional model that shows the subsurface distribution of aquifers. Views of the geology also can be tailored for analysis by less technical map users and are used to develop derivative maps. Three-dimensional geologic maps have moved into a new era with the advent of geographic information systems (GIS) and computer-assisted visualization of unit surfaces and volumes (fig. 1). Figure 1. Block diagram showing surface-elevation map of the Mahomet Sand aquifer within a buried bedrock valley carved by glaciers and river water. From Soller and others 1999). Map users can generate three-dimensional views of the data at any locality of interest. Multiple cross sections (fig. 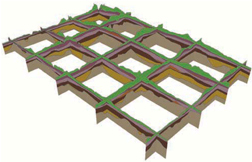 2) can be selected from a three-dimensional block of geologic information (fig. 3). 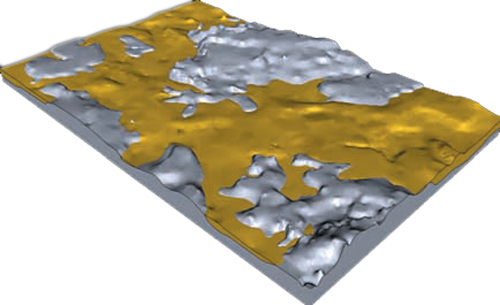 Surface-elevation maps can be chosen to show the shapes and features of the tops and bottoms of buried geologic units. Depth slices can show the geologic units at a selected depth below land surface. Elevation slices can be selected to show units at a given elevation. Maps can also be produced to show the thickness of geologic units. In many areas of complex geology where specific units cannot obviously be correlated, the contacts between units cannot be generated and surface elevation and thickness maps cannot be made. The mapping solution in these complex areas can become a "landscape model" based on the probability of finding a particular unit within a conceptual vertical sequence of materials. Figure 2. Fence diagram of composed of nine cross sections through the surficial deposits and upper bedrock in east-central Illinois. From Soller and others (1999). Figure 3. Block diagram of surficial deposits in east-central Illinois. From Soller and others (1999). Recent advances in computer technology and geographic information systems provide scientists with new ways to organize, display, and analyze the complexities of three-dimensional geology (fig. 4). These advances are changing the function of geologic map products. Now, geologic, hydrologic, biologic, and demographic information can be combined in interactive three-dimensional models. The need for timely delivery of such detailed models and derivative map products is increasing. Also, geologic maps and three-dimensional models are linked to a digital data base, so the digital product are managed and updated as new data or new interpretations of old data become available. Figure 4. 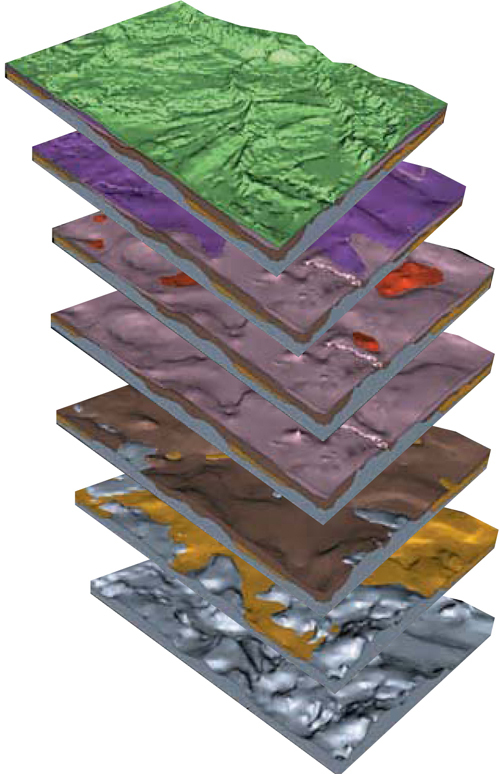 Three-dimensional computer model of glacial deposits in east-central Illinois. 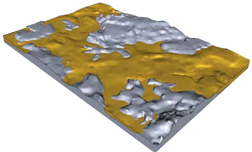 The top image represents the present surface of the land. The bottom image represents the land's surface before glacial. The top six layers show successive glacial deposits. From Soller and others (1999). Jack-up barges and Hovercraft that can be used as drilling platforms in shallow water bodies and in sensitive environments. Soller, D. R., Price, S. D., Kempton, J. P., and Berg, R. C., 1999, Three-dimensional geologic maps of Quaternary sediments in east-central Illinois: U.S. Geological Survey Geologic Investigations Series Map I–2669, 1:500,000-scale; U.S. Geological Survey Web page, <http://pubs.usgs.gov/imap/i-2669/index.html>, date accessed, December 11, 2008. Central Great Lakes Geologic Mapping Coalition, 1999, The Central Great Lakes Geologic Mapping Coalition: U.S. Geological Survey Fact Sheet 153–99, 2. p.; U.S. Geological Survey Web page, <http://pubs.usgs.gov/fs/fs153-99/fs153-99.pdf>, date accessed, December 5, 2008.